We're BAAACCCKKKK! So the dust and the wrapping paper have barely settled around my house, but I'm happy to report I'm back on the blog...and back at the party! 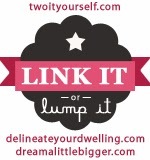 As always, Amy from Delineate Your Dwelling, Allison from Dream A Little Bigger and I are thrilled to have you partying with us for the last Link It or Lump It Party of 2013! Since we extended the party for a week over the holiday, I'll be picking a few extra features this week. Of course Amy and Allison will also be picking their favorites as well, and featuring them on their blogs. Here's a quick look at what we were up to around Two It Yourself last week...Gotta love scheduled auto posts (sneaky, sneaky we are at 2IY). Hello Little Home shared a great tutorial on how to make hot chocolate four ways. Yum...Yum...Yum...Yum! Thalita who blogs at The Learner Observer shared a super easy, by totally awesome Dollar Store project - paint-dipped bamboo spoons. How fun are these? Such a cute housewarming gift idea! Pretty much all the jewelry Kolture Shoq makes - I love. But this one makes me want to hunt her down and steal it! How awesome is this chain and zipper bracelet - and the tutorial to DIY is super easy. I want one in every color...like, NOW! I am very much aware that it's now after Christmas, but I couldn't resist Jackie from It's Organized's post on how to add sparkle to your gift wrapping. How adorable are these gifts? 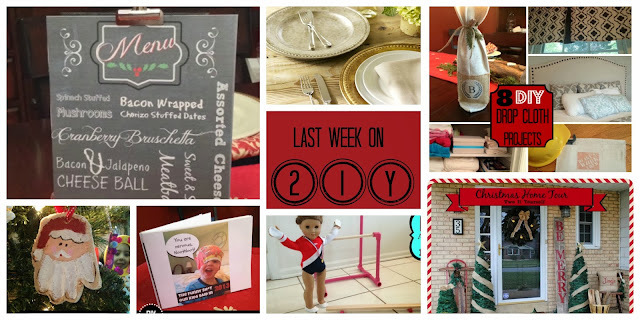 And she has even more gift wrapping ideas on her blog. And finally...I love the master bedroom makeover reveal from Home Coming! These two have such a fun, funky and colorful style. 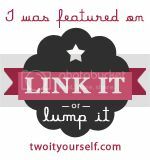 Plus, you won't believe the difference from 'before' - amazing. BTW we won't be picking features next week as we'll be hopping of the blog to spend time with our families during the holidays. But, we'll be back the following Sunday with extra features.